One of my favorite cities in Europe is Barcelona–city-wide afternoon siestas, late-night dancing and cheap sangria? Three of my favorite things in a beautiful city on the beach. When I was deciding where to study abroad, Barca was the only other place I seriously considered besides Amsterdam–and though you probably know I couldn’t be happier with my choice, I definitely wish I had more than 48 hours in this zesty Spanish city. Among other things, Spain is famous for tapas and paella. On the first afternoon, I was exhausted from dealing with a delayed flight, so my friend and I stumbled to a bustling restaurant that seemed pretty reasonable. We ordered a variety of small plates, like papas bravas and pan con tomate, and some tasty sangria. This meal would be less than memorable if I hadn’t been so damn hungry. Spain was one of the places I went in Europe that had a Dunkin Donuts–happy selfies commenced along with an iced latte and sugar-loaded donut. There was one in the train station by Gaudi’s Sagrada Familia, which we only admired from the outside. One of my only regrets from my adventures abroad is not shelling out the 20 euros for admission into the cathedral. The weather was incredible when I was there, and we spent a lot of time wandering around the historic district. We went to La Boqueria, a large, incredibly crowded food market, famous for quality Iberico and fresh fruit. We strolled along La Rambla and settled on a place to get paella–definitely got ripped off trying to find authentic food in such a touristy area, but we were dying to sit down and have something cold to drink (more sangria). The supermarket we went to later to get snacks was selling paella for 2 euros a serving. Go figure. After a much needed siesta, I forced my travel buddy to rally so we could hit the clubs. The nightlife in Barcelona is right on the beach, and is unlike anything I’ve experienced. The club scene in New York is a game all it’s own, but in Barca, it was come one, come all. Everyone’s there for dancing and good times–and tequila shots. The next morning, we took a hungover stroll to Park Guell, another Gaudi site that was a little gentler on our wallets–and in walking distance of our Air Bnb. It was super hot that day, and an uphill walk to the park, so we stopped for some slushy drinks. So, when should I go back? I could literally talk about Amsterdam forever…and since it’s part of the eat-a-city series, I’m going to! When I originally thought of this series, my idea was more “city in a grocery bag.” But since a lot of the places I’ve travelled to were very short visits, I decided to do more of a food diary…though A’dam is kind of an exception considering I lived, grocery shopped and cooked there. This blog post is a love letter of sorts to Albert Heijn, the most perfect grocery store in all the world. One of the best parts of living in Amsterdam was the incredibly cheap groceries–they were cheap by American suburban standards, and prices were drastically lower compared to Gristedes/Morton Williams/Fine Fare/every subpar supermarket in NYC. I’m talking loaves of bread for 65 cents, Dutch cheese for a dollar, and insanely delicious salads for $4…granted, the groceries were priced in euros, but the conversion rate was very close to 1:1 when I was there. One of my favorite products at AH was the guacamole kits they had in their produce section–it cost just under $3 for two avocados, a lime, a tomato, a chili pepper, garlic, and shallots, a.k.a. everything you need to make your own guac. For perspective, I paid $2.29 for a single avocado at the Tribeca Whole Foods yesterday. Two very typical Dutch treats that I came to love were stroopwafels and hagelslag. Stroopwafels are wafer-thin waffle cookies sandwiched with a sticky, caramel-like syrup. You could buy a package of 12 for around $1 at the store, but lots of street vendors sell homemade ones the size of your face, hot off the griddle. Hagelslag are like quality chocolate sprinkles–sprinkled on buttered bread is a standard breakfast item in this beautiful country. One of my favorite things to eat in Amsterdam was a veggie burger from a little restaurant called Burgerlijk. Wandering around in a hungry daze, I stumbled upon this gem when my friends were visiting over their spring break. I can be particular about veggie burgers…and I’m not sure what this one was made of, but it was incredible. Like, I think about it way too much. The whole thing is super customizable–lots of different cheeses, toppings, and sauces, and their fries are also incredible. I took my meat-eating parents here when they came to visit, and they were impressed with the regular beef burgers. I also went to another incredible restaurant when my folks were in town (read: free dinner) called De Vergulden Eenhorn. It’s on the outskirts of the city in a restored farmhouse–honestly as “me” as it gets–and they have just a handful of items on their menu, all of which are exceptional. I always think it’s better for a restaurant to have four entrees that they do really well, rather than ten that are just ok. We went twice because it was so damn good, and I had cauliflower soup, barley risotto, and sea bass. The restaurant makes their own bread, aioli, and hummus, which were also delicious. What are your favorite Amsterdam eats? It’s no secret that I love to travel, and nostalgia from my European adventures last year inspired me to create a new series, “eat-a-city.” One of my favorite things about going to new cities was trying the local cuisine, as well as perusing supermarket shelves for groceries that seemed familiar or interesting. 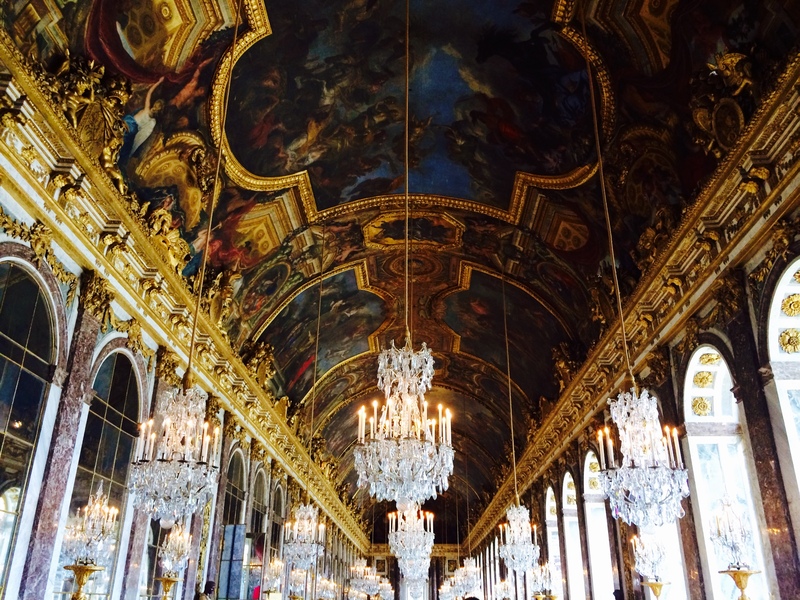 I’ve decided to write posts about my favorite eats in each city, starting with Paris. 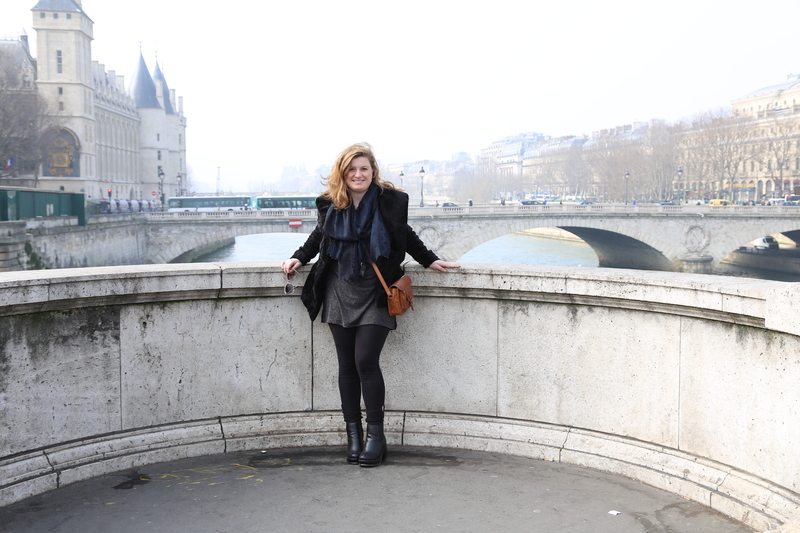 My time in Paris as a 21-year-old was a major carb-fest. Baguettes and crepes were eaten at least once daily, supplemented with French cheese and Nutella. On our day trip to Versailles, we brought along bread, cheese and chocolate to have a picnic lunch, and I are Kinder Buenos for breakfast everyday. Kinder Buenos are now my favorite candy bar–it’s like a Nutella-filled chocolate bar, and I honestly don’t understand why they’re so hard to find in America. Finding affordable restaurants in Paris was also quite difficult for some reason, and I recall having an omelet and French fries for dinner on two occasions. My favorite meal in Paris was, funnily enough, at an Italian place called Sapori di Parma, a hybrid market/deli/trattoria (I discovered this place thanks to a quick Google search for cheap eats near the Eiffel Tower). My friends and I were a bit hesitant about eating Italian food in France, but this place was totally a diamond in the rough. We asked if we could just get one item instead of the three-course menu put in front of us, and the waiter, who spoke a charming mix of French, Italian and English, happily obliged, offering us any pasta dish and a glass of wine for ten euros. I had homemade, half-moon shaped gnocchi in a gorgonzola sauce and a glass of white wine. 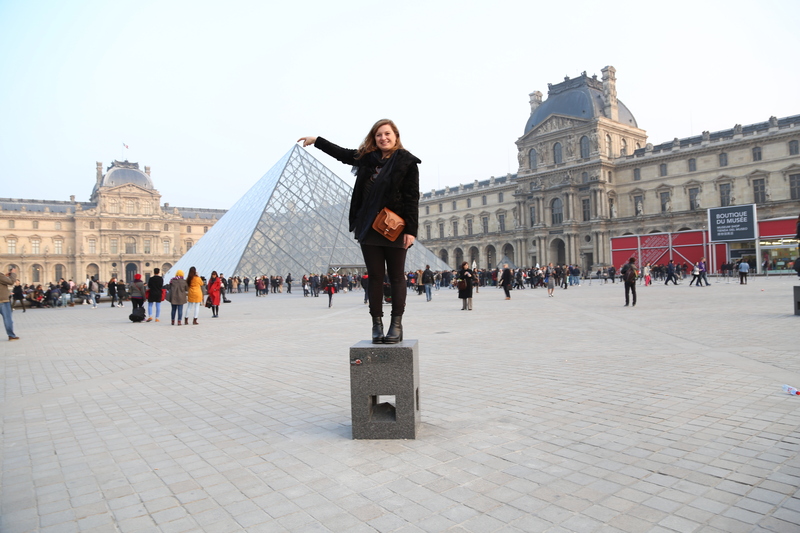 I really did not love my long weekend in Paris–of course, it was incredible to see the iconic landmarks I’d been dreaming of my whole life, but stepping away from warm, welcoming Amsterdam to a city that detests foreigners wasn’t especially pleasant. I recently told my mom that I’ll only go back to Paris when I have enough money to splurge on a nice hotel and can eat at Michelin-starred restaurants. Have a must-eat spot in Paris? Let me know here! For most of my life, I’ve been forgettable–and I’ve been good at it. Remember that scene in “The Princess Diaries” when someone literally sits on Anne Hathaway/Mia Thermopolis because they didn’t even notice she was there? That should give you an idea of how I felt up until a few years ago. In high school I was drafted as “shy” and “quiet,” two adjectives I would never assign to my current self. My freshman year of college I would go to parties and bars and meet lots of different people–but when I waved to them the next day, I’d be greeted with a lack of recognition. I feel that I’ve become more assertive over the past two years, with a tremendous change when I studied abroad. Amsterdam means SO much to me, and my growth in independence is one of the reasons why. I learned more about myself in five months of living there than the past three years of college. I did things I wanted, when I wanted. I made friends with the guy who freed my bike after I broke the padlock’s key…so the next time it happened, he volunteered to help once more. I dyed my hair blonde. I biked miles and miles. 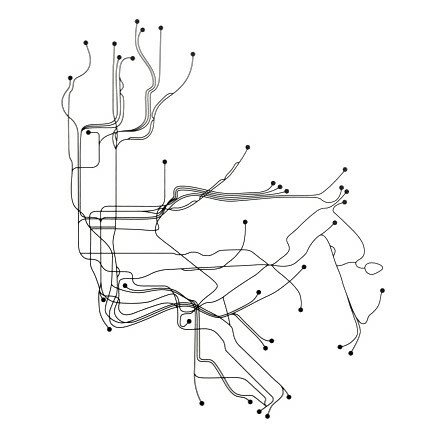 I looked at art. I ate lots of stroopwafels. I started drinking beer. I started liking beer. I constantly, consistently was in awe of the city’s beauty. One year later, I’m still not sure how it’s possible for a place to be so stunning. This past year, I’ve started being more confident in my career goals and skills. I learned to work on a team–on a professional level. I learned how to say no. I started asking for what I want. And now that a brand new, unplanned, simultaneously terrifying/exhilarating chapter of my life is beginning, I’m excited to continue growing. I will never get over this place. I’m literally tearing up as I picked these photos (no, I only had one glass of wine), and I am missing Amsterdam oh-so much these days. I can’t believe that next month it will be a whole year since I said farewell to this beautiful city. Before I left for study abroad, I dedicated an entire Pinterest board to Amsterdam-themed pins. But no amount of tulip photos or canal views could prepare me for the beautiful place I was about to spend a semester in. I miss riding a bicycle everywhere, wandering through the floating bloemenmarkt, and taking full advantage of free museum admission. I was SO incredibly happy here, and I really found a home there. My parents came to visit, not expecting very much, and totally fell in love with Amsterdam. I’m telling you, this is a special place. Go to A’dam, and stay for more than a couple of days. Drink a Heineken at an outdoor cafe, eat as many sticky stroopwafels as you can, and soak up the incomparable beauty that is this magical place. I’ll be back ASAP. Is there any place quite as idealistic as Paris? I grew up believing it was the chicest place on earth–convinced the poodles grew cotton candy colored fur and everyone wore fabulous clothing (guess I watched Madeline a few too many times). And while there were many well-dressed Parisians, I didn’t catch a glimpse of any pastel pink pups. 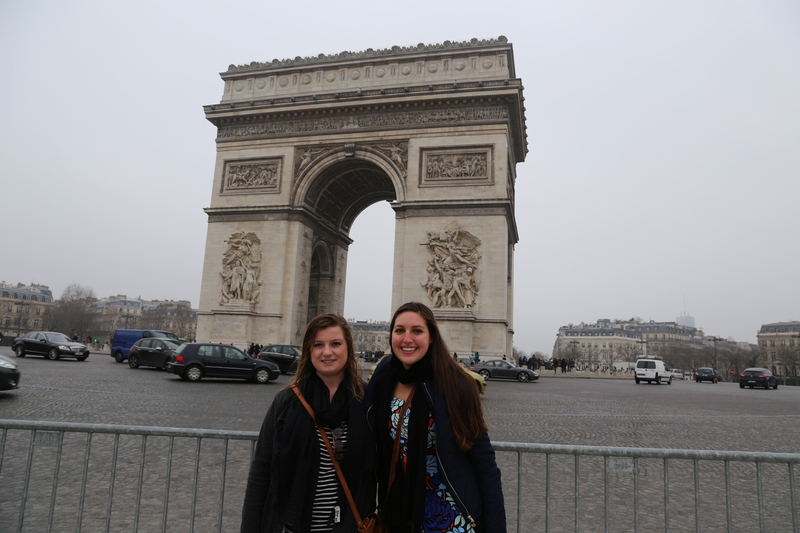 More so than other places I’ve traveled this semester, Paris felt very temporary. It didn’t feel like a place you could make a home, and it seemed to me that it would be difficult to assimilate into French culture. People say the Dutch are rude, but I couldn’t wait to get back to Amsterdam after my brief weekend. That considered, Paris is full of amazing things. 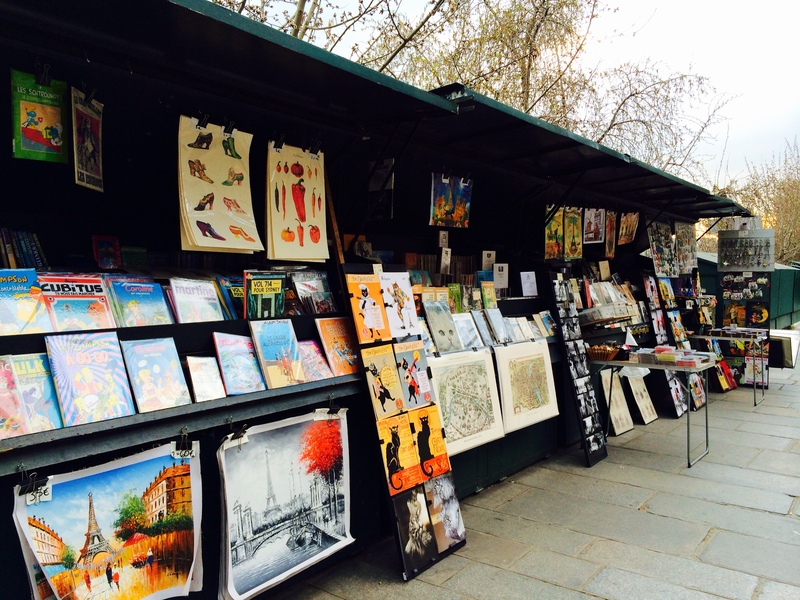 There’s art everywhere, stunning buildings, and crepe stands on every corner. It’s literally a tourists dream, and there was WAY too much to even attempt to do in just one weekend. I’m on a tight budget, so I did what I could to see the things I’d always wanted to while spending as few euros as possible. Day 1. Arrived at lunchtime and ate bread and cheese ($5) while strolling along the Champs-Élysées. Visited Notre-Dame (free). Climbed to Sacre Coeur (free) and refueled with a $3 Nutella crepe because ~when in Paris~. Strolled down a flower market, posed for pictures in front of Moulin Rouge (another film that can be blamed for my disillusionment). Visited the Louvre after 6pm when it’s free for under-26 guests, and I saw the legendary Mona Lisa. Day 2. Kinder buenos for breakfast set me back $2, and then the day was spent at Versailles. We tried desperately to convince the ticket desk to let us in for free (there wasn’t even a student discount!) but were unsuccessful and forked over €15…I’d say it was worth it. Luckily, for 3/4 of the days we were here, public transport was free! I don’t speak French so I’m not sure what the reason was, but I’m definitely not complaining. Also on this day I walked 13 miles, so the gnocchi I had for dinner (€10+complimentary Pinot Grigio) was devoured without a guilty conscience. 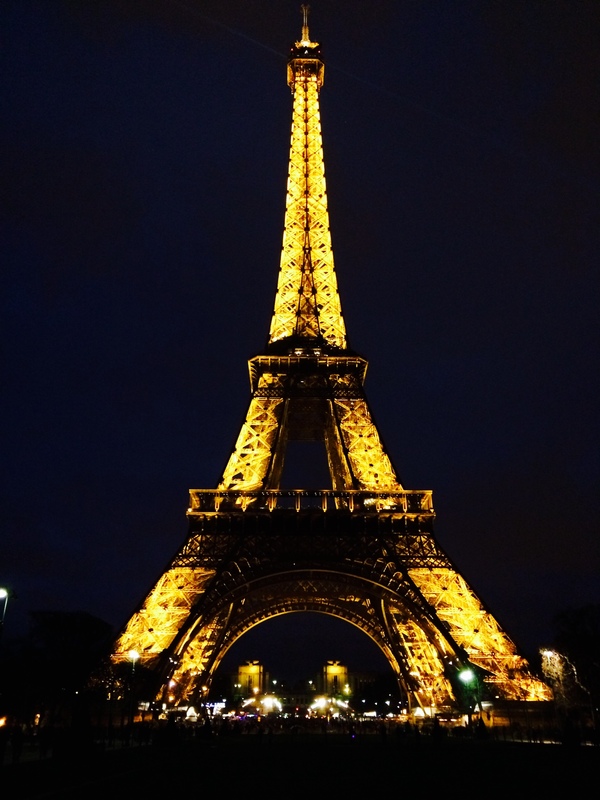 We frolicked around the Eiffel Tower after dark, watching it sparkle in awe. Before going to Paris, I thought that the Eiffel Tower was way too hyped up and overdone, when, in fact, it was stunning. It was amazing that something so industrial was so beautiful. Definitely a great spot to pop champagne. Day 3. Went to a Flea Market that was super hyped up, but it was really just a less aggressive version of Canal Street. Two new pairs of shoes for less than $20 made me a happy girl, though. Afterwards, we made our way to Pont Neuf and browsed the book and souvenir stands, and I splurged for some Babar the Elephant paraphernalia. 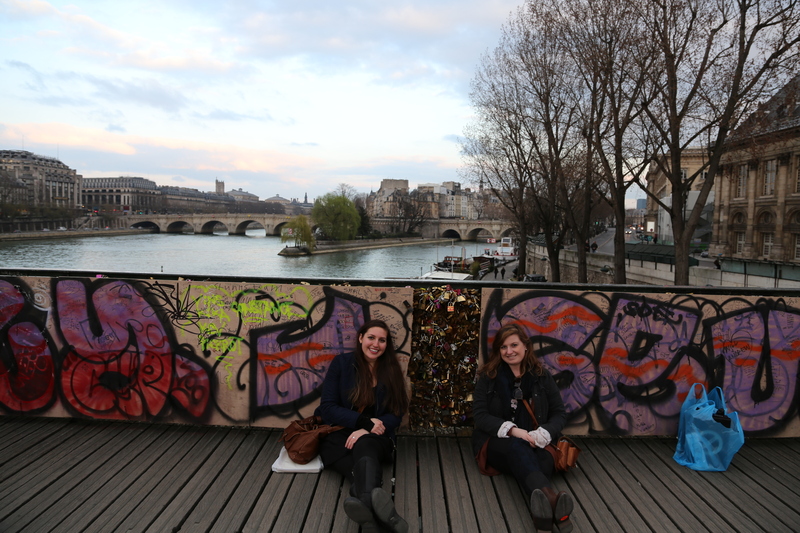 My roomie and I put a lock on the Love Lock Bridge, reassuring the lady who took the photo below that we’re friends, not lovers. Day 4. The morning before my train left, we went for brunch and crepes and leisurely enjoyed the sunshine. When I pictured myself in Paris, I imagined I would sit in a cafe drinking black coffee and smoking a cigarette, perhaps while wearing a beret. While none of those things happened, I still loved my time in the city of light. 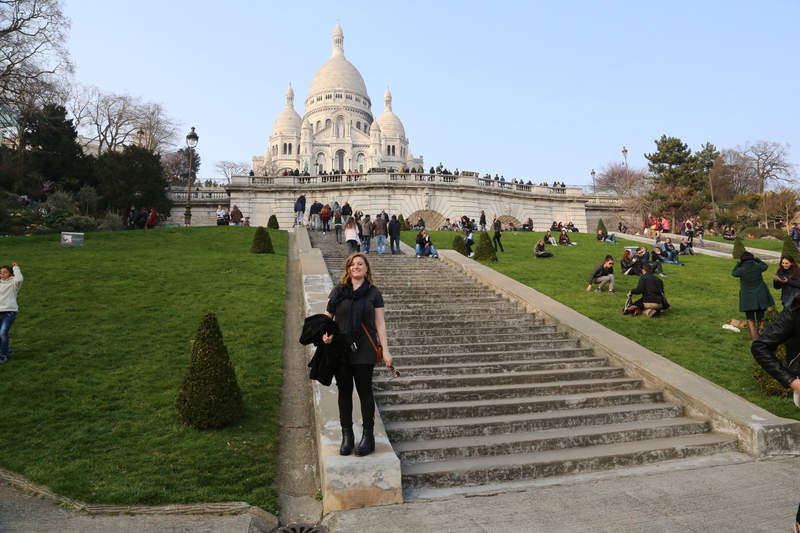 There are many more things I would love to do in Paris, and I will definitely be back someday, hopefully when my checking account balance is a little less depressing.